We are really keen to know what your thoughts are about the journey thus far and what next. Below we have outlined the three top ranked initiatives carried over from the 2017/18 Founding Members Forum and formulated them into actionable initiatives. It's time to let us know your thoughts. ACTION ONE / PRIVATE INFORMATION: Develop printed and digital information resource (Guide Books) providing Maps, terrain grading and Tour Suggestions for destinations across the entire Alpine National Park (NSW & Vic) for sale with members discount. ACTION TWO / PUBLIC INFORMATION : Develop digital only information resource (Guide Books) providing Maps, terrain grading and Tour Suggestions for destinations across the entire Alpine National Park (NSW & Vic) provided for free to the community. ACTION THREE / NO INFORMATION: Would you prefer that maps/ guides and other access information be kept on the lowdown such that already heavily impacted areas do not receive even more traffic? If there is anything that you would like to ad to the agenda let us know. If there is any resource or function that you would like to provide or perform then let us know. 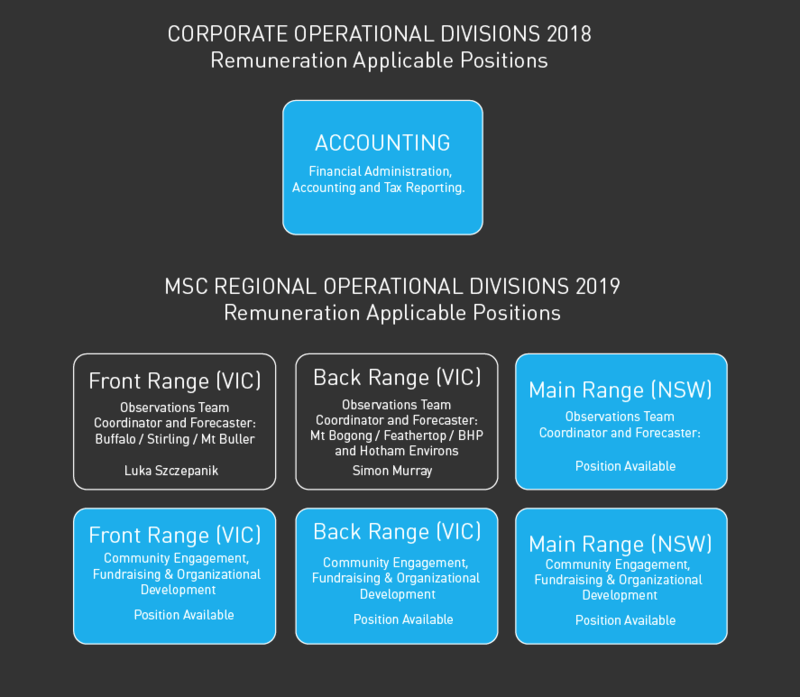 Below is a basic outline of our organisational structure as we move forward into 2019. As indicated by the blue tiles there are a variety of roles we are looking to fill within the organisation moving forward. Sadly or former secretary Alex Lockie has had to step down due to obligations within her new day job. The role of Secretary really puts you up there in the drivers seat of the MSC, but you will need to bring experience relevant to the role. Similarly there is a need for regional directors to help both garner and canvas divisional initiatives and community participation and use this to steer and guide the board. Similarly within the operational capability we are looking for some help with tax accounting and 'Not-for-Profit' clout, an Avalanche Forecaster and some general FROTHERS to help carry the flag regionally.